When one thinks about it, the science fiction writers are really the only people -- despite all the mystic mumbo-jumbo of the millennia -- who have effectively predicted the future. Bradbury, alone, predicted the big screen TV and ear buds in his Fahrenheit 451. I have seen the storm clouds for years now and I have referenced them in many posts. One of the things I have seen is that Orwell's predictions have begun to come true. Maybe he should have called the novel 2017 instead of 1984, though it would not have been as neatly poetic for a book written in 1948. But we should not make the mistake of thinking that Donald Trump is the problem, here. Once again, he is the symptom; the symptom of a world that has allowed itself to use misinformation as a tool and to become its own Big Brother. We, the people, are the entity that shuts down dissent. We are the ones who are now condemning, say, peaceful protest. We are the ones who swarm, like ants over melting chocolate, over those who don't agree. All a power-hungry administration needs to do now is to jump on the wave. So, Orwell was right, he just did not see all of the picture. The populace are the grass-roots of the Big Brother government. We have become an entity that is willing to smother the individual; to accept and even to encourage misinformation when that misinformation serves our purposes. In other words, it isn't that Big Brother forced us to our knees; it is that we have become mentally lazy and even willingly deceived/deceptive when it comes to facts. Perfect timing for a less-than-honest administration to show up; like a bird of prey exploiting the weakness of a dying desert animal. It seems to me that the mind is most controllable when it allows itself to be. Yes, it can be broken when it is strong, but why not just do it when the time is right; when our innate sense of truthfulness is in flux; when the paradigms we have depended on forever are crumbling around us? Is 2+2, 5? Well, it sure as heck has been for a long time. But, what if we call the numbers something different? What if the first number two identifies more as a seven? What if we decide that the equation only works if the numbers represent similar things? What if we don't really think 2+2 equals five, but we are wide open to discussion about the idea because the person who thinks it is is scary? -- or can hook us up with things we want? -- or shames us into saying we believe it? -- or threatens what we love if we don't agree? Welcome to 2017. We need to not be Winston; we need to be Captain Picard. 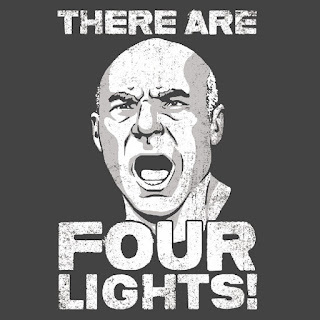 If there are four lights, there are four lights, come hell or tsunami. Help the world. Share this. Use this hash tag: #read1984now. The worst aspect of this mental laziness is the growing polarisation of viewpoints. The middle ground appears to have vanished in a number of countries, whether it's between Trump and Clinton supporters, pro and anti-EU Britons, or Islamists and secularists. I'm depressed by the inflexible attitudes and the sheer shoutiness of it. It's all becoming very tribal. As someone who generally sees both sides of the argument, I feel reluctant to open my mouth. Steerforth -- Your last sentence sort of sums up the most horrible outcome of all this... I feel the same, very often.